The Swamp White Oak (Quercus bicolor) is a very valuable hardwood tree found growing in the Mississippi River Floodplain. It is well adapted to flooding and offers food (acorns) and cover to wooducks, songbirds, turkey, deer and other wildlife. Members of the BPCA and natural resource agency staff responsible for river management observed a loss of floodplain trees in the Black River Bottoms and on Lake Onalaska islands. In the fall of 1991, under a Special Use permit issued by the U. S. Fish and Wildlife Service and with technical assistance from the US Army Corps of Engineers Forestry Office and the La Crosse County UW Extension office, BPCA devised a plan to begin collecting swamp white acorns, grow seedlings from the acorns in a nursery on the BPCA property and transplanting oak seedlings on designated Mississippi River and Black River floodplain land. Monitoring and maintenance of the planted trees is also part of the plan. A key to the success of the planting is the use of tree tubes made from biodegradable cellulose. The tubes act to protect the seedlings from animals that would girdle the tree or eat the branches and buds. The tube also extends the growing season by acting to provide a warm environment and reduce competition from grass and weeds. Swamp White Oak Seedlings planted using the tree tubes on sites that were prepared for planting have shown remarkable growth. Several of the trees planted in 1993 and 1994 are over 20 feet tall and are bearing a few acorns. Much has been learned in the past 14 years about swamp white oak. It is a very resilient floodplain tree if given a chance to germinate and grow. Acorns were collected in the fall of 1991, planted in a nursery in the spring of 1992 and transplanted to the Mississippi River floodplain in open growing sites in 1993. The seedlings sprouted leaves and soon were growing well in their tubes. Then came the summer flood of 1993 that put the seedlings under water for 2-4 weeks. In addition considerable sediment washed over the trees and in some cases tubes were washed away. In early July the water receded revealing leafless seedlings. By August 70 percent of the seedlings had releafed and over 60 percent of the trees planted in the spring of 1993 survived to grow the next year. Usually Mississippi River floods happen in spring before the trees leaf out or in fall after the main growing season. The swamp white oak is truly well adapted to the floodplain environment. The BPCA and partner agencies have continued this volunteer project by collecting acorns, growing seedlings and planting them each spring. 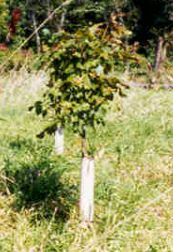 As of 2004 nearly 3000 seedlings have been planted on a variety of sites. Soon an acorn on a tree grown from a seedling will be collected by a BPCA volunteer and planted the next year in the BPCA nursery to grow a mighty oak on the bank of the Mississippi River. For additional information on this project see: "Battle for the Islands - Grass vs. Trees", Big River Magazine, July-August 2004, pp 28-29,41.